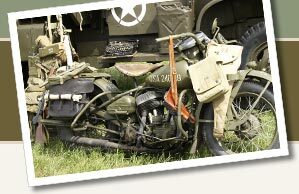 World War II Memorabilia, including hats and helmets, unit patches, field packs, medals, pins, ribbons, and photographs. V1710 ALLISON ENGINE EXHAUST "SHORT STACK"
WW2 US Yank Magazine "Military Courtesy" May 7, 1944 British Edition! USMC (001) Vintage USMC Photo Naha City 6th Div.